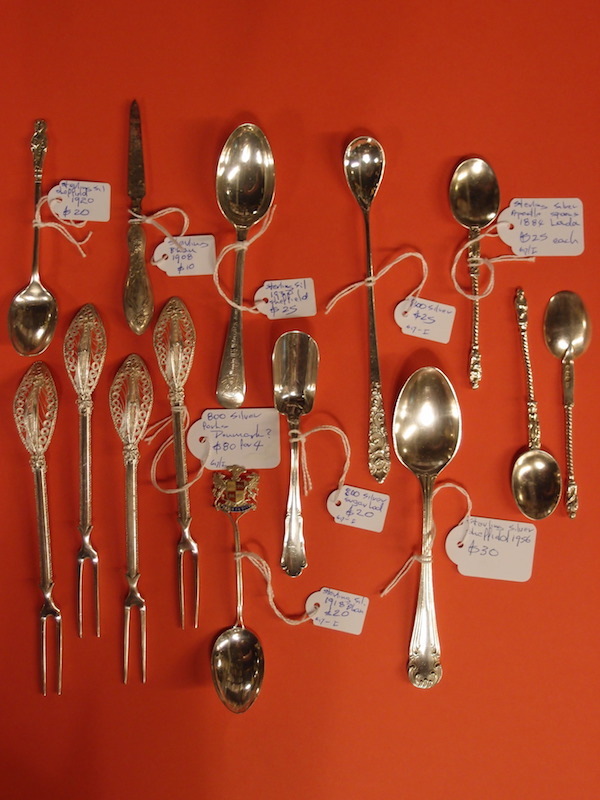 A selection of our useful sterling silver teaspoons, Apostle spoons and other hallmarked silver pieces mostly priced at about $25 each. For your next "hostess gift" or Kris Kringle consider recycling an old piece of useful antique or vintage hallmarked sterling silver, rather than buying a new, mass produced piece of Chinese Resin that is stuffed full of carbon miles and comes in a block of styrofoam. A selection of our useful sterling silver teaspoons, Apostle spoons and other hallmarked silver pieces mostly priced at about $25 each. For your next “hostess gift” or Kris Kringle consider recycling an old piece of useful antique or vintage hallmarked sterling silver, rather than buying a new, mass produced piece of Chinese Resin that is stuffed full of carbon miles and comes in a block of styrofoam.